Well folks, it's done! Our CD is finally finished and "in the can" as they say. It will be sent out for duplication tomorrow and available at our album release party on April 25th. For any of you local readers who would like to join us for our big concert that night, make sure to reserve your tickets now. There are only 50 more available! Click here to order. I know I've been yacking about this forever, but this is a big project and it takes a lot of time - especially with 15 songs. First you have to prepare the songs, then spend several days in the studio recording them. Next you have to edit and mix them to your liking. And finally you have to take pictures and come up with album text. In the end however it was all worth it. This is an extremely well-produced record with excellent songs and I couldn't be prouder to be a part of this project. I'll be creating a link for purchase in a few weeks if anyone is interested in buying one. Plus, I'll be adding samples to our band website in a few days as well. In the meantime, bear with me as I continue to finish up my home projects and other band-related things. I'll be back online soon. Oh, and one more thing... please feel free to wish my mom well as she recovers from a very painful case of shingles. From everything I've heard, that is not something you want to deal with when you're nearly 80 years old. Yay, I get to be the first to say congratulations! I look forward to hearing it. And Lois, yikes, Randy had that a few years ago and it was awful. Hope you feel better soon! Congrats! Where's the CD release party? Is there a prize for the one that travels the farthest? mom thumb - Yay, I get to be the first to say thank you! bill - Why not. Free CD to the farthest guest. Bill's buying. Awww, your poor mom. I hope she feels better soon! And congratulations! I can't wait to buy a CD! Congratulations! And I hope your mum get over that soon. My mum had shingles and it was not nice! Yes, congratulations, Jeff, and definitely will be interested in purchasing when it comes out. And sorry to hear about your mom, we'll keep her in prayer. Congrats! I'll try to make it to the party! Wishing your mom well. My MIL had shingles shortly before our wedding. Not fun. Wow, congrats!!! I'll be ordering a copy when they're ready. How exciting for you. And best wishes to your mom - I hope she's better soon. elizabeth - Thanks. She reads these comments so I'm sure she'll get your wishes. babs - Yes, they can be horrible, or not so bad, or anywhere in between. Sounds like she's coping for now (good drugs I assume). unfinished rambler - Awesome. Thanks. caron - Hope to see you. Make sure you walk up and slap me if you come so I don't miss you. mooselet - Excellent! CDs should be ready in about 2 weeks. Thanks for the well wishes for mom. mrs r - Thanks. I'll wear my lucky socks. Oh very cool! Congrats, and I can't wait to hear some of it. I'm definitely not making the launch party but ... I'll be there in spirit? And yuck with the shingles. My gram had that, and it was NOT fun. I hope it goes away fast. The first thing I thought when I saw this post was, What a cool tile effect! 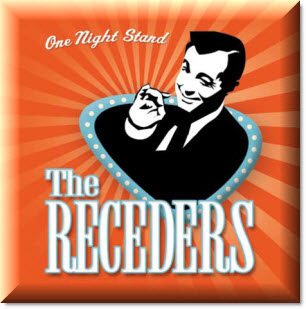 The second thing was, Way to go, Receders! That is truly an accomplishment to be proud of, and I look forward to snagging a download. And my best wishes to your mom. I've heard shingles are VERY painful. I hope she recovers quickly. I wish we could get back down for the party; dang it, just missed it by a few weeks!